So this has been a Looooong time coming, and I apologise for that (don't really know where the months are going)! 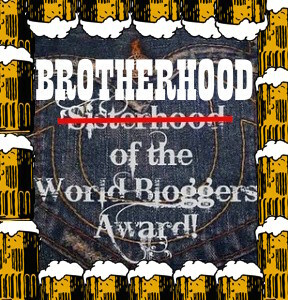 So I was tagged by Daniel @TheBlogBookshop, check out his site HERE, to celebrate the Bros in Book Bloging (Hells Yeah) which I support wholeheartedly...lets get more guys reading and blogging....so thank you for that!! Question 1. What's the best ARC you've received this year? Ohh (sometimes it's actually hard to remember :o). I think the best was There Will Be Lies by Nick Lake. I remember having the pack and thinking ok...sure I'll give it a go, starting it and being like wow there are some typesetting errors and then being blown away when I realised the reason for it and getting so caught up in the book and the dream world that was interweaved. Such a good book! Everyone read it! Question 2. Paperback or Hardback, which is best and why? Question 3. Do you have an eReader and do you prefer it to a physical copy of a book? I do have an eReader, two if you count my tablet and actually three if you count my phone, but I use that the very least of all for reading. I donfind them very useful (but still mainly buy print books if it's a book I want). I find they work in a good tandem and sometimes I need them because there isn't a physical copy of the book...so its not necessarily that I prefer one to the other is now more a necessity thing. I do remember not being so keen when they first came out and really hating how the flicker when the page turned on the old models...oh how times have changed! Question 4. Whats the first book you remember buying and how old were you? I really want to say Harry Potter when I was in year 6, but that's probably a memory has so I'll share a different one. I remember being in the Books etc (RIP) in Victoria coach station and looking in the teen section, and I came across Darren Shan. By this time there were a couple already out and I pickd up The Vampires Assistantm which was book no 2 and then Cirque Du Freak and purely based on the cover I picked The Vampires Assistant...and thus started my Love for Darren's book, and also my judge a book by it's cover phase. Something I don't stick to now, but something that is a deciding factor when loking at a book for me. If we don't know a book the cover is what draws people in and I can normally tell a lot about a book from its cover and I like that. Question 5. What fictional character would you like as your best friend? This is hard, because yes you know a character but I find I don't necessarily know them as I do my best friend, so could they be completely different in real life! I remember years ago I used to love the character of Suzy Turquoise Blue and I haven't read the books in years but she always sticks out to me, so possibly her. Or a younger Thursday next! Now THAT would be a lot of fun! Question 6. Who is the nicest author you've ever met or chatted to online? Question 7. What book has been on your shelf the longest that you just havent gotten around to reading? Haha this is most of my shelf, so picking one that's been there the longest is hard! Especially when my shelf isn't even here with me right now... I never did finish The Hobbit after getting bamboozled when I tried to read it in year 6, so that's deffo up there. As a compulsive book buyer I know that I'll buy a book and not read it for years, but it'll be a happy retirement one day! Question 8. What book parents would you like to have as your own? I feel like I read so many books where there isn't a paret or only one...so this is a bit of a weird one. Having never had a father, I feel like I don't need one, but would like a father figure like Dumbledore in my life because everyone needs someone like that. As for mother...ummm I really want to say Mrs Weasley, even though I really should pick from outside this one book!! But she was so amazing and had such passion and care you'd deffo want her, even if she is a big fusspot! Question 9. Which book could you read over and over again if your TBR pile wasnt so overflowing? I'm starting to feel like a broken record...Harry Potter for sure. I only read them late last year and I want to go back to them! There are a couple though... Philip Pullman I easily could. A series of unfortunate events... The Amulet of Smarkand for it's pure comic value. Stephen King's Blaze. I just read the Marvels..but any of the Brain Selznick I feel are very dippable if you wanted sometime to read one rainy afternoon. Question 10. Explain your love of books to an alien who has just landed on planet Earth? This would depend on whether they understood emotions in the same way as us! I want to refer back to by Blood Ink Fire post on life without books and the void it would be as a way of explanation and VOID is a great word for that empty space that would exist...the size of a galaxy if I didn't have books. I LOVE BOOKS! And I'm going to do the same thing as Daniel...I sort of enjoyed answering these questions so I want you tagged guys to answer the same 10 questions!! !